Fergus is a heritage consultant with almost thirty-five years’ experience in archaeological and historical research and in developing outreach strategies for both the public and private sectors. He graduated in archaeology from the University of Glasgow in 1984 and, after a few years in the trenches, started his own heritage consultancy in 1989. Since then he has worked on over three hundred projects ranging from prehistoric to industrial landscapes and from medieval castles to 20th century modernist buildings, in places as diverse as the Highlands of Scotland and the United Arab Emirates. His first love, however, is the history of Glasgow where he has been involved in surveying, researching and excavating throughout the city. He acts as an advisor to the Glasgow City Heritage Trust, and is a founder of the Glasgow’s Gilded Age project. He also works regularly on television as a contributor to STV’s The People’s History Show. 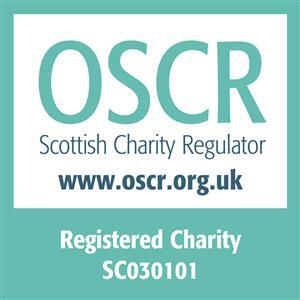 Gerald Blaikie is a retired Chartered Surveyor who spent 32 years working with Glasgow City Assessor’s Department, creating and maintaining detailed records of old and new properties entered in the city’s Valuation Roll and Electoral Register. He has a keen interest in Pollokshields and surrounding areas, using his Scotcities website to share knowledge gathered both from his work experiences and by his continuing urban exploration. 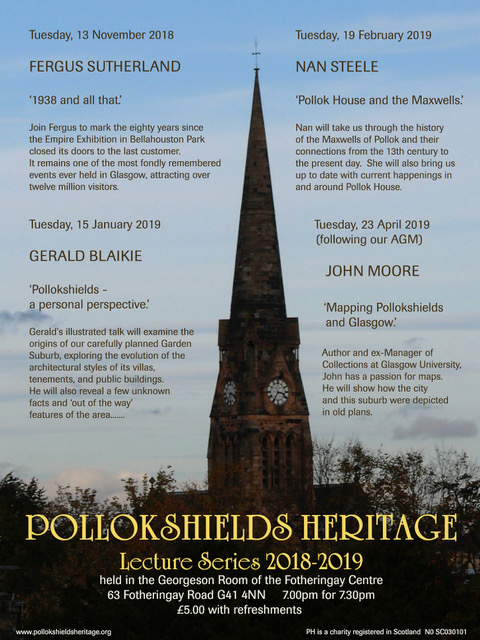 Nan will take us through the history of the Maxwells of Pollok and their connections from the 13th century up to the present day. She will also bring us up to date with what is happening in and around Pollok House in the present day. Nan spent 17 years working as a guide at Pollok House with the National Trust for Scotland during which time she developed a great interest not only in the Maxwell family and local history, but also in the historical characters in many of the wonderful paintings kept there. She is especially fascinated by the Hapsburg family, who ruled Spain for 200 years. Although now retired from the trust, she still maintains a great interest in Pollok House and is there regularly as a volunteer guide. She participates in all sorts of activities within the house including costumed murder mysteries and costumed presentations. A look at how the city and the suburb were depicted in old plans. John Moore retired in 2017 after nearly 40 years’ service at Glasgow University Library where he ended his career as Collections Manager. He has had a lifelong passion for maps and has studied and written extensively on the history of Scottish cartography for more than thirty years. He is the author of Glasgow: mapping the city (2015) which was short-listed for a Saltire Society Non-fiction Award and followed this up last year with The Clyde: mapping the river. All Lectures 7 for 7.30 pm in the Fotheringay Centre.